England's players did the mannequin challenge during their 2-2 draw with Spain at Wembley on Tuesday, becoming the latest sports stars to embrace the social media craze. Jamie Vardy struck a 'standing-still' pose to celebrate scoring with his second-half header and was joined by team-mates including Theo Walcott and Raheem Sterling. "We had a little idea, thought it was the perfect time to get it started and everyone followed," Vardy said. The trend started in America last month and has since gone viral, with defeated US presidential candidate Hillary Clinton, singers Adele and Beyonce, and comedian and presenter James Corden among those joining in. 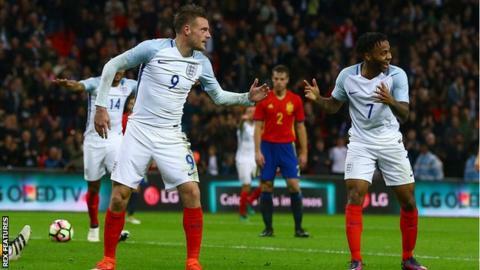 Is Spain's mannequin challenge better than Vardy's? The world's top two tennis players, Andy Murray and Novak Djokovic, were among the first European sports stars to attempt the challenge before the ATP World Tour Finals in London. German football team Borussia Dortmund came up with a brilliant effort while working out in the gym, in a clip that also features the NFL side Pittsburgh Steelers and basketball team Kentucky Wildcats. A group of professional golfers practising for the Asian Tour's Manila Masters also did their own version of the challenge. BBC NFL pundits Osi Umenyiora and Jason Bell joined members of the show's crew to take part in a superb mannequin challenge - although host Mark Chapman seems strangely unaffected. And Dan Walker manages to be in three places at once during Football Focus' nod to the craze. The trend started in a Florida high school last month and has quickly spread on social media. The instructions are straightforward: get a load of friends together, everyone strike a pose, and make sure you film it. Five 16-year-olds say they started the craze and admit they have been surprised at the response - particularly from sports teams, with the Dallas Cowboys NFL team and stars of WWE wrestling among those getting involved stateside.